Although the DOC’s announcement of zero-percent antidumping tariffs on 31 Vietnamese shrimp exporters is just a preliminary decision, the transparency of Vietnamese businesses has been proven, an official has said. The preliminary duties were announced following the DOC’s 13th Period of Review (POR 13). Tran Thanh Hai, Deputy Director of the Export-Import Department under the Ministry of Industry and Trade, said the success was the result of close coordination among businesses, associations and state agencies in dealing with importing countries’ barriers and protection measures. He noted when the antidumping duties were cut to zero, tariff barriers will be reduced, helping boost shrimp exports to the US. Echoing this view, Truong Dinh Hoe, Secretary-General of the Vietnam Association of Seafood Exporters and Producers (VASEP), said this result indicates that Vietnamese firms sold shrimp to the US at prices that fairly competed with shrimp from other sources and that they did not dump their products. He considered the zero-percent tariffs an encouragement to shrimp exporters to the US this year. Ho Quoc Luc, Chairman of the Board of Directors of the Sao Ta Foods JSC based in Soc Trang province, said in previous PORs, only a few businesses received a zero-percent tariff. However, in the latest review, 31 shrimp exporters were assessed as having competed fairly in the US. They hope that this preliminary tariff will be maintained in the DOC’s final ruling this September, he added. 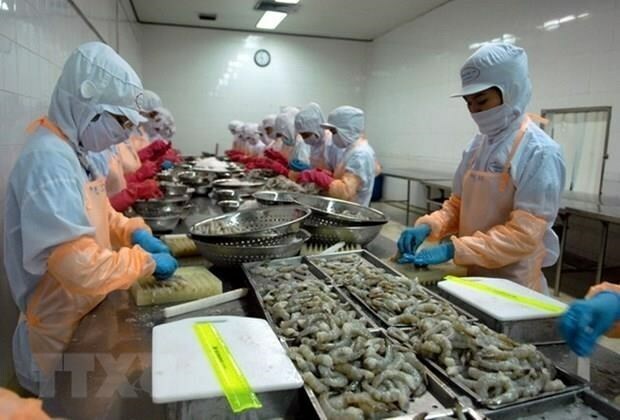 According to VASEP, Vietnam’s shrimp exports were estimated at 550 million USD in the first three months of 2019, down 15 percent year on year. Tran Van Pham, General Director of the Soc Trang Seafood JSC, attributed this decline to fierce competition with shrimp products from other countries like India and Ecuador which have expanded their shrimp farming areas over the last two years. As a result, shrimp prices have fallen, leading to lower export value. With zero-percent antidumping tariffs, Vietnam’s shrimp industry will now have more competitive edge than some other countries’, he said, adding that the US is still imposing antidumping duties on shrimp from India, Indonesia and Ecuador.